Frank Rupp Design, Inc. is a full‑service Graphic Design Company dedicated to helping small businesses reach their full potential. Located conveniently in historic Media, Pennsylvania, Frank Rupp Design provides small businesses in Delaware County and Chester County with an affordable option for effective and professional graphic design. As a small business owner myself, I am keenly aware of the challenges associated with operating a business. Budgets are strict and time is at a premium. With my help, you can save money and concentrate more time on actually running your business. Clients receive creative services that are tailored specifically to their individual business needs. By applying creative concepts, focused branding and advertising strategies, your business can be set apart from the competition. 10 BEATTY ROAD - Professional Office Suites of Media. 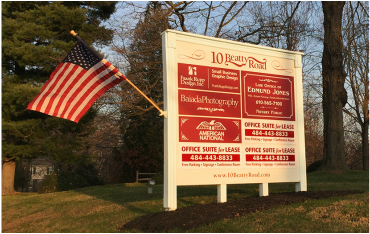 For information about available office space, please visit ﻿www.10BeattyRoad.com﻿. Frank Rupp Design, Inc. is located at 10 BEATTY ROAD in Media, PA.